From athletes to couch surfers (and everywhere in between), just about everybody deals with foot, ankle, or heel pain from time to time. Sometimes, a little rest is all you need. But for some, the pain is stubborn and just won’t go away, even after seeing a specialist or trying a wide variety of treatments. When your feet aren’t working properly, even simple tasks become complicated. Does this sound like you? If so, laser therapy could be the answer you’ve sought after. View Our Laser Therapy Videos Here! Combined with a traditional rehab plan, it can provide sweeping relief and produce dramatic results, getting you back on your feet faster than ever before. This exciting option is available from Dr. Harvey Danciger at our Palm Desert, CA, podiatric office, where we invest in cutting-edge technology to provide the highest quality care to all our patients. How Does Therapy with Lasers Work? MLS (Multiwave Locked System) Laser Therapy is non-invasive. It is not surgery. It will not cut or scar. There are no known side effects, and the procedure does not produce any pain or discomfort. It is an FDA-approved, effective treatment method that uses a simple beam of light. It’s no ordinary bulb, either—the system uses specific wavelengths of light that can penetrate the skin and stimulate cellular activity in tissues exposed to the laser, energizing the body’s cells and coaxing them to engage in activities with profound healing benefits. When activated by the light energy, your body starts working overtime to fight the inflammation and reduce swelling, providing pain relief. It speeds up your natural recovery time, accelerating tissue repair and new cell growth. It can help close wounds, reduce scar tissue, and even improve nerve function. Can Beams of Light Really Help with my Foot Pain? What Can I Expect Out of This Therapy? Treatment is entirely pain free and takes place in our office. Sessions are brief—in most cases, just five to 10 minutes. Depending on your specific condition and whether the pain is acute or chronic, a treatment series may last an average of six to 10 sessions in total. Although each case is different, if you’re like most patients you will begin to notice significant improvement after just a few therapy sessions—even in as little as one to three appointments. Since the treatments are cumulative, you should continue to feel better and better after each appointment. 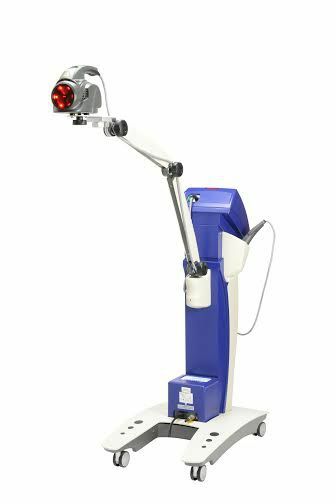 When combined with traditional rehab strategies, laser therapy can dramatically improve even the most stubborn foot pain in a relatively short period of time. Unfortunately, treatments are not always covered by insurance plans. We try to make the procedure as affordable as possible given this limitation. Dr. Harvey Danciger will be able to provide more specifics after evaluating your specific condition and determining the length of the treatment plan required. If you’ve been dealing with pain that will not go away, has been affecting your mobility, and keeping you from doing the things you love, MLS Laser Therapy could be the tool that finally gets you back on your feet. We recommend it as an option to all our patients who deal with any painful condition due to its high rate of success and easy, quick treatment schedule. For more information or to schedule an appointment, please contact Dr. Harvey Danciger at our Palm Desert, CA, office. You can contact us through this website or by calling (760) 568-0108.